Hendrik Hertzberg, a senior editor and staff writer for The New Yorker included a link to one of my posts in his blog Tea Without Milk. 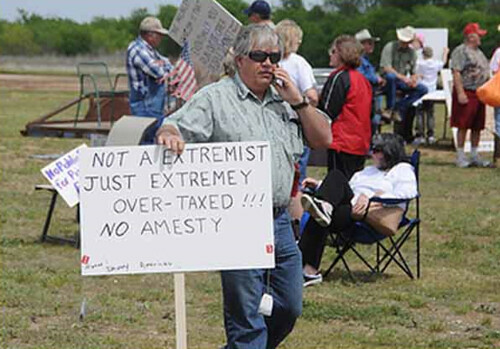 His post links to one of my series of posts on signs at tea party rallies. The police can check immigration status (“Papers, please!”) of anyone whom the police have a “reasonable suspicion” is in this country illegally. 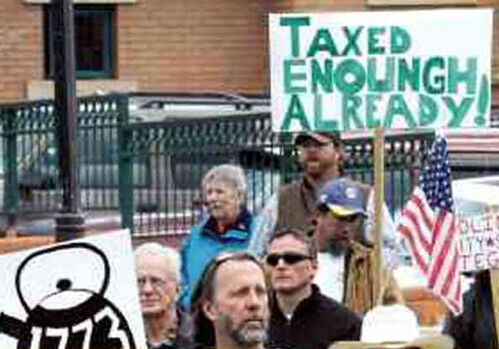 Citizens of Arizona can sue Arizona municipalities and agencies that do no enforce the law. So, let’s imagine the following scenario: Bob Builder knows (or suspects) that his competitor, Fred Tonka, is using undocumented workers in his construction business. So Bob calls the local sheriff to report this fact (or suspicion). Do the police now have “reasonable suspicion” such that they are obligated to check the immigration status of Fred’s workers? And if the police choose not to act on Bob’s tip, does Bob have the right to sue the police for failing to enforce the law? Or, let’s take the Rodriguez family and the Gutierrez family (I’m purposely using Hispanic names because I think we all know precisely who this law is aimed at). Raul Gutierrez is dating Sandra Gutierrez, but they get in an argument and break up. To get even with Raul and his family, Sandra calls the police to report that Raul (or even just some members of Raul’s family) are undocumented. Again, must the police investigate? And if the police don’t investigate, can Sandra sue? Better yet, what if former Congressman J.D. 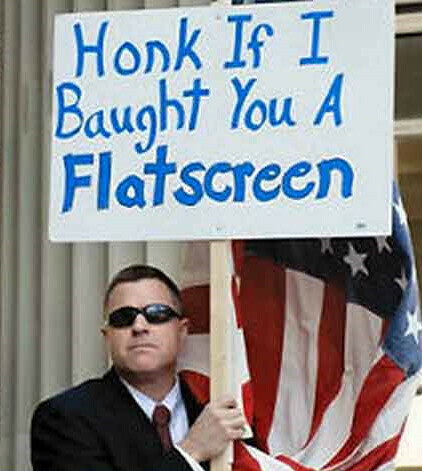 Hayworth, presently challenging Sen. John McCain for the Republican nomination for Senate, were to call the police and tell them that Sen. McCain employed an undocumented immigrant to mow his lawn. Putting aside the fact that Hayworth, as Rachel Maddow so ably demonstrated, is fact-averse, would that call be sufficient to require the police to investigate? And if they didn’t, could Hayworth sue the police? Finally, if a police officer sees a group of Hispanic men standing at a street corner or a gas station trying to find day labor employment, is that activity in and of itself sufficient to form a “reasonable suspicion” upon which the officer must act in order to avoid liability? What if an officers sees someone purchasing a long distance calling card? What about a person who shows up at the police station to see a family member who has been arrested because they couldn’t prove that they were here legally? I’m also curious to know what happens to an individual who the police “reasonably suspect” not to be in this country legally, but who is, in fact, a citizen? Say, for example, the police pick up a day laborer who doesn’t have a driver’s license (or simply doesn’t have it with him). What are they supposed to do with that person? Must they arrest him and take him into custody and force his family to come forward with proof that he is a citizen (or legal resident)? And what sort of proof do we expect minors to have to show that they are citizens? Must a Hispanic minor now make sure that he or she has some kind of ID before going out on a Friday night with friends “just in case”? It also seems that an unintended consequence of the law will be to increase the demand for forged out-of-state documents so that undocumented immigrants can, at least under minimal scrutiny, “prove” that they are lawfully in the country. I could probably go on at length (I said at the beginning that I’d try to be brief) with the problems with Arizona’s new law. 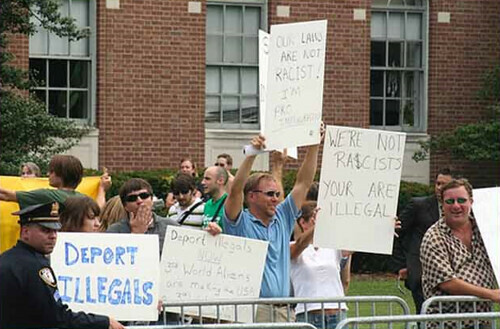 Instead, I’ll simply conclude by noting that a law that encourages racial profiling solely for immigration-related issues, runs so far afoul of what I believe our country stands for and the rights and privileges granted by our Constitution, that every citizen who cares about protecting right from wrong should stand up and loudly condemn this law. 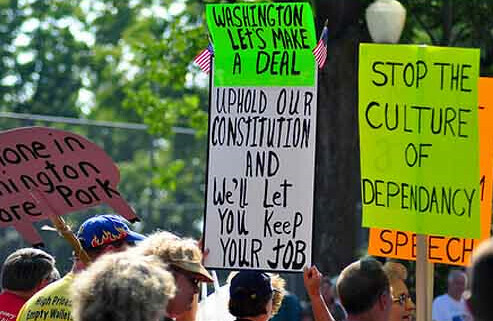 The silence of the “anti-big government” teabaggers is truly deafening… We need comprehensive immigration reform; we don’t need knee-jerk, reactionary, racist laws. And for those I know who like to vacation in Arizona … perhaps the time has come to find another destination rather than giving financial support to a state where people run the risk of being asked for their papers solely because of the color of their skin or the whim of an overzealous police officer. Well, I finally bit the bullet and migrated this blog away from the old FTP system that Blogger is discontinuing as of the end of the month. By and large, it looks like the migration went OK, though I’ve noticed a few little quirks. Let me know if you see anything unexpected or the blog behaves (or, I suppose, fails to behave) in an unexpected way. This blog is now located at http://blog.wallack.us/. 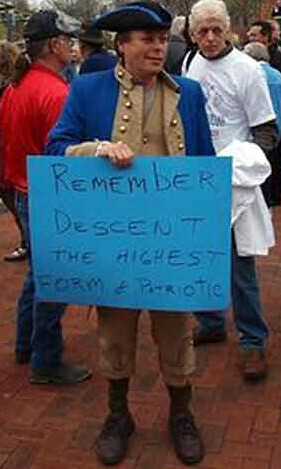 In the past, I’ve posted several sets of photos of signs taken at Tea Party protests to show the hateful, racist, and violent rhetoric. 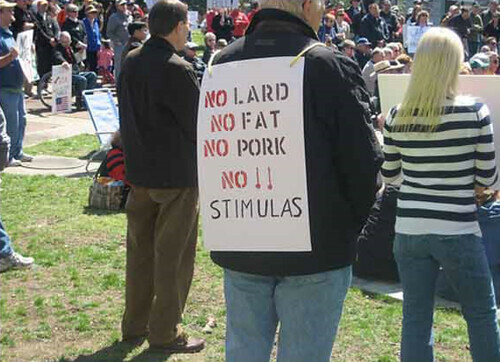 Today, I want to return to the subject of Tea Party signs, but from a slightly different perspective. 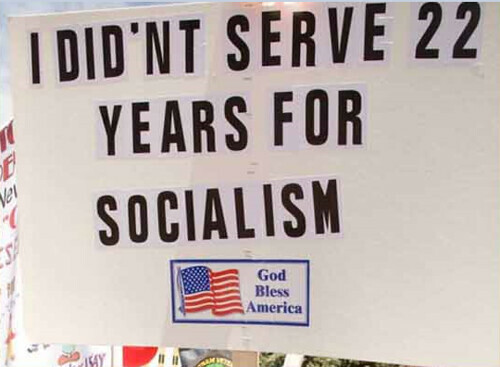 Now, before looking at the signs, it is important to remember that these protesters think our country is on a downhill slide to socialism, communism, fascism, totalitarianism, and who knows what else. In any event, I think that it’s fair to conclude that they are worried about the future of America. 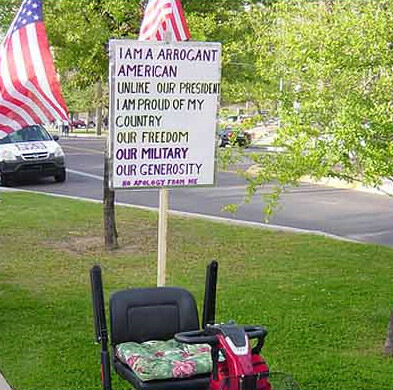 Well, as these signs should attest, we should all be worried about America, but not for the reasons these folks are. 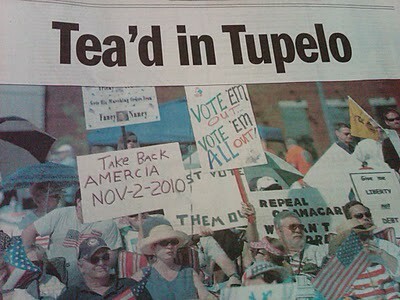 The idiocy of the teabaggers has led to a whole new dialect: Teabonics! And yes, Sarah Palin was the first person to actually speak this new dialect. You betcha. You need to look at the following signs very carefully. I’m going to keep this simple. 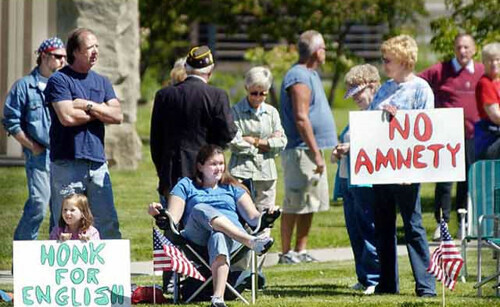 If you can’t spell “America” you probably shouldn’t be at the protest in the first place. 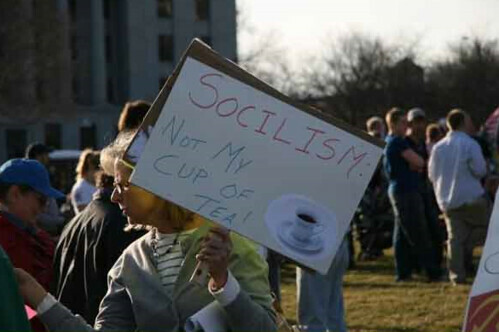 Frankly, I don’t know many people who want to drink Socilism, either. 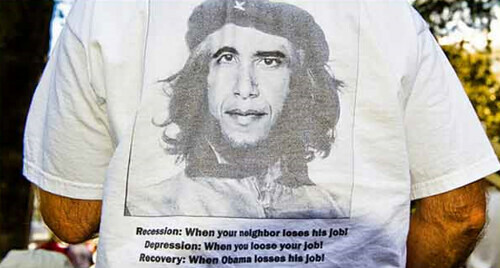 The person wearing this shirt apparently doesn’t want any of that Socilism either. 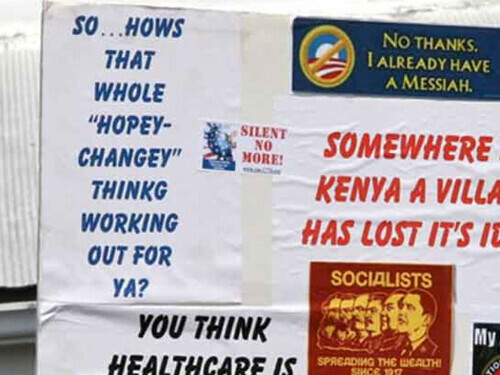 Others apparently worry more about President Obama being a “socialest” and approve of Sen. McCain’s former status as a “mavrik”. 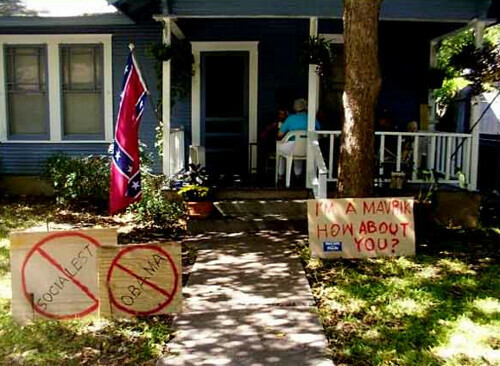 And remember: That Confederate flag has nothing to do with racism, either. I don’t know Rep. Nancy Pelosi; Sen. Tom Coburn (R-Oklahoma) says that she is a “nice lady”. 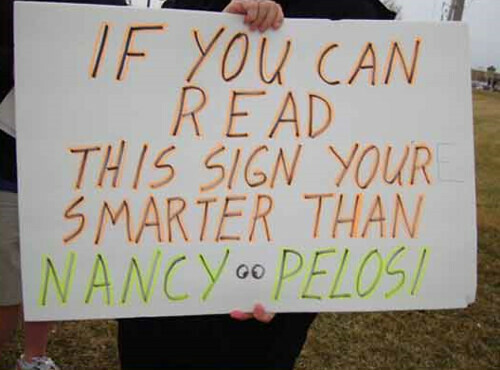 In any event, I suspect that before you get elected to be the first woman Speaker of the House, you probably learn that “your” does not mean “you are”. So either he added an apostrophe to “your” or he forget the “e” in “you’re”. In either event, he’s an idiot. 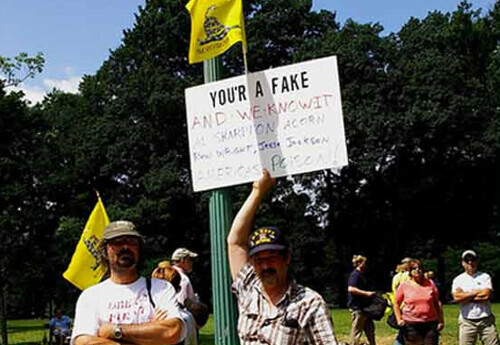 I’m am outraged that you managed to get through school without learning the difference between “your” and “you’re”. 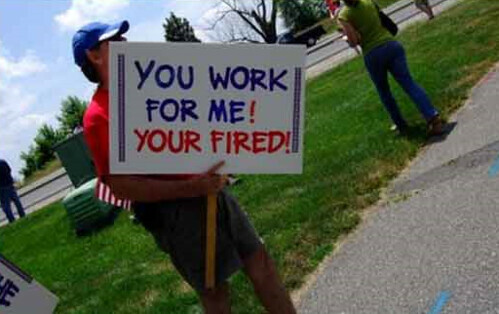 Actually, I suspect that you’ll be fired if you don’t learn to differentiate “your” and “you’re”. Next up in the Mr./Ms. 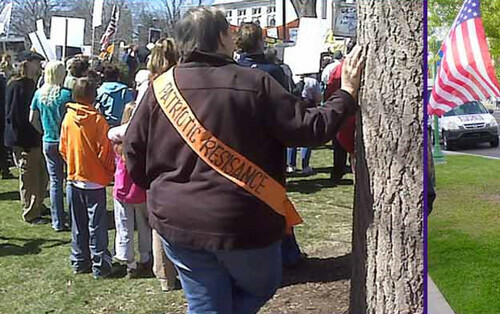 Teabag America pageant, is Mr./Ms. “Patriotic Resisance”. We’re not sure where that’s located, but it sounds like a nice place for a summer vacation. So how does this “Wealth Redistribtion” thing work, anyway? Also, should I be more worried about Red Communism than say, Blue Communism, or maybe Purple Polka Dot Communism? Oh, I see. 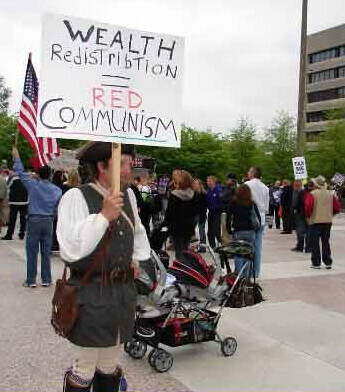 Redistribtion of wealth involves deviding. Got it. 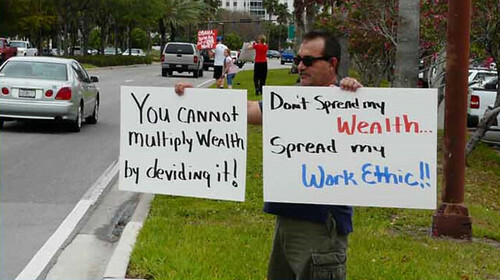 By the way, with regard to his work ethic, I think standing on the street complaining is a terrific example of work ethic, don’t you? 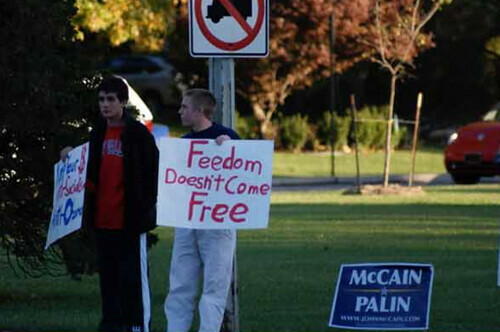 No, “Feedom Doesn’t Come Free” … but a good public education does. 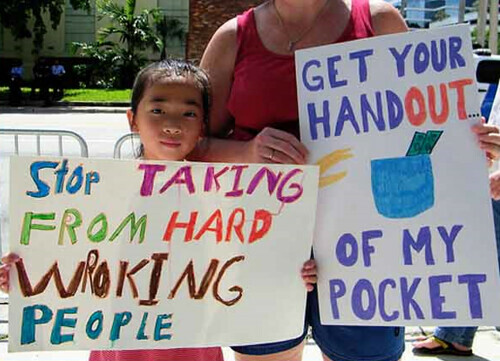 This kid might try it instead of standing around protesting. His teachers must be so proud. Given that the housing crisis was a large contributing factor to the current economic situation, you’d think that this guy wouldn’t be worried about a “mortage”. 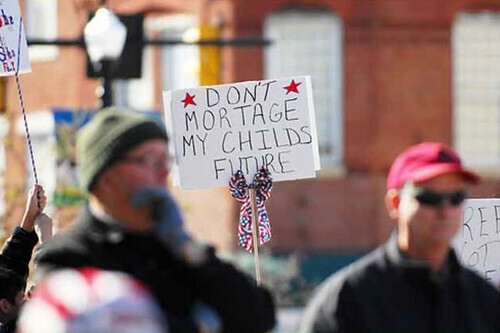 But his “childs” future should be great without any pesky apostrophes. “Your are illegal”? 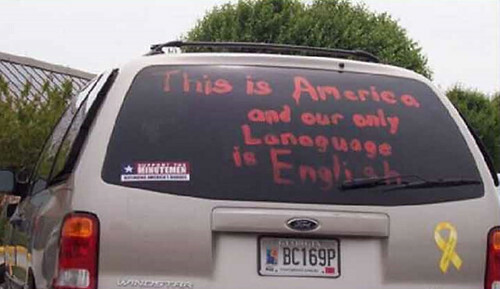 Is that supposed to be “You are illegal” or perhaps “Your our illegal”? 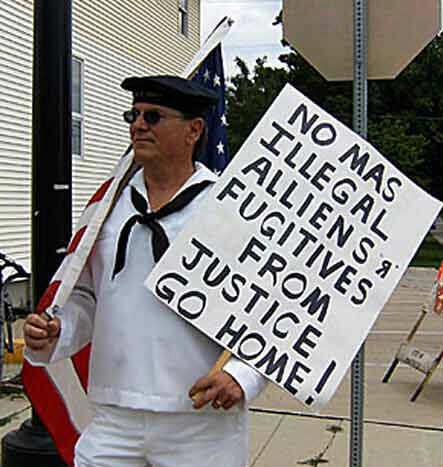 I didn’t know that the US was a ship upon which “boarders” needed to be controlled. 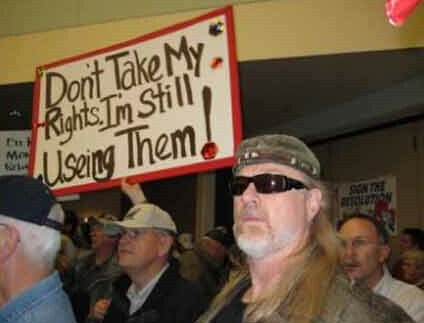 Ah, but these folks have American flags and mutton chops, so they must know better. I’m confused. Are “stimulas” a kind of meat or are they something that you cook with? Maybe he meant spatulas? 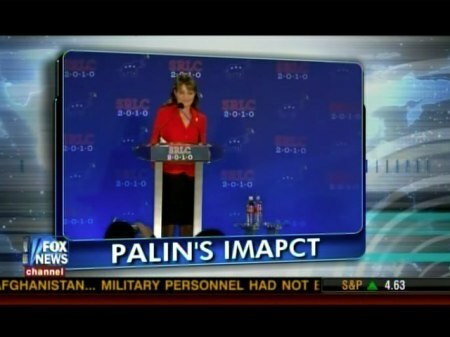 I’ve worried about “Palin’s Imapct” since she came on the scene. What exactly is a “theif”? It could be a military term with which I’m unfamiliar. 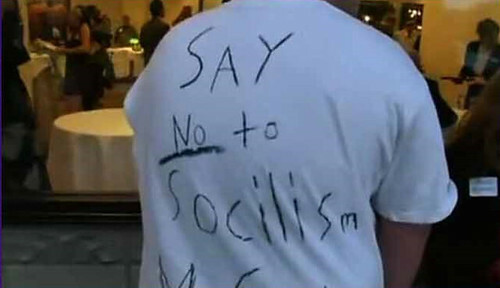 How embarrassing must it be to spend money to have a t-shirt printed and not use your spell check first? The word “loses” is supposed to appear three times; he spelled it correctly once. 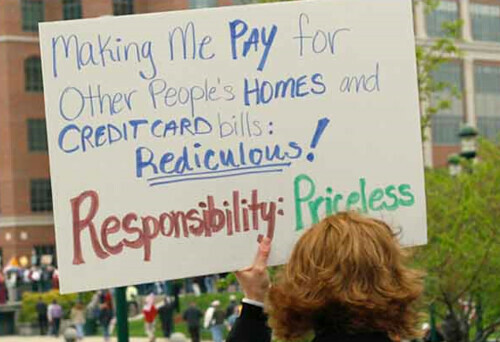 Maybe we should add the following line: Remedial: When you have to go back to school to learn to spell! 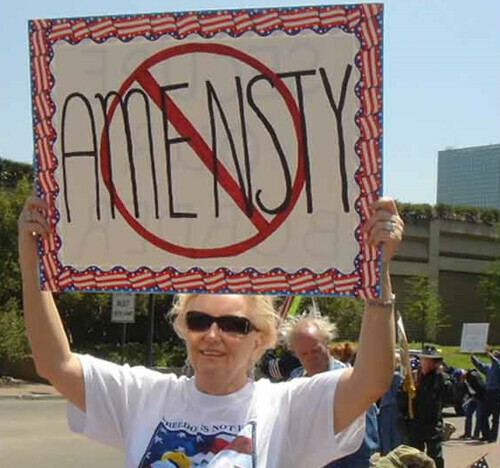 I think that I’m against amensty too, just on principle. 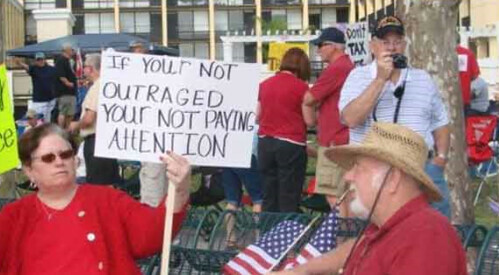 It sounds too much like something you might catch from hanging around teabaggers for too long. I presume that she has more than one of these “daugters” about whom she is worried. 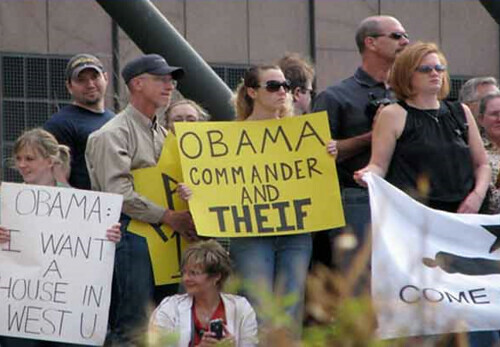 I make the presumption of plural possessive because I know that teabaggers understand, quite well, the proper use of apostrophes. Two mistakes for the price of one! (How quickly did you spot ‘em?) 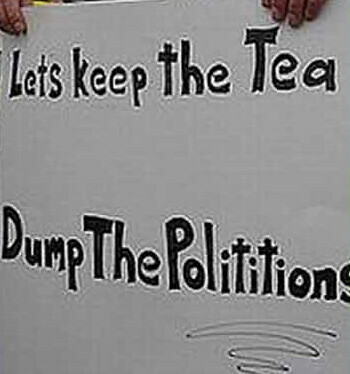 I’m not sure about dumping “Polititions”. That sounds like it might be environmentally unfriendly. Shouldn’t we recycle or at least put them in a properly maintained landfill? (I know this one is hard to read. 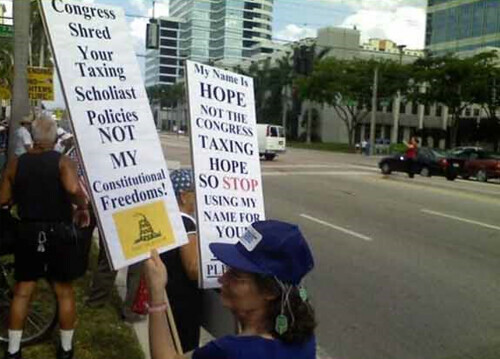 It says “Stop Waisting My Hard Earned Tax Money”.) 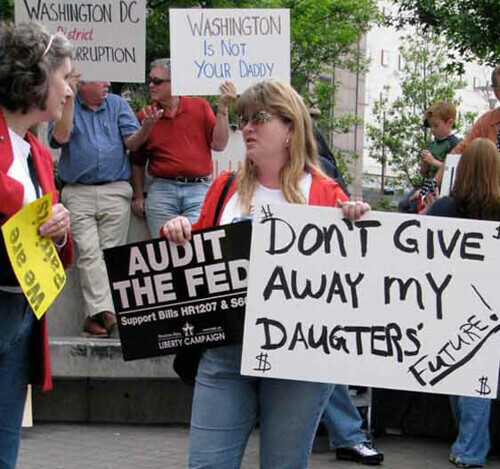 I didn’t know that the government had been putting her tax money around people’s waists. 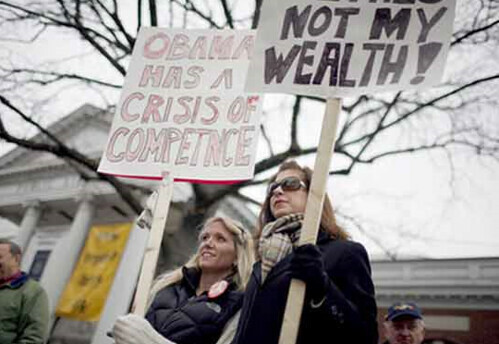 I also hope that President Obama has a “Crisis of Competnce”; if so, it might suggest that he prefers competence, instead. I’ve never seen people “wroking” hard, have you? 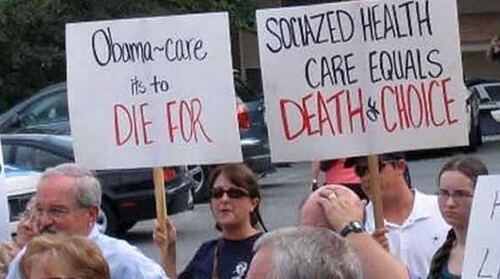 I wish the person who made this sign spent more time “useing” spell check and less time making stupid signs. The culture of dependency may be a problem, but if dependency on your spell check program helps avoid misspellings like “dependancy”, then perhaps it’s OK. I love this one. 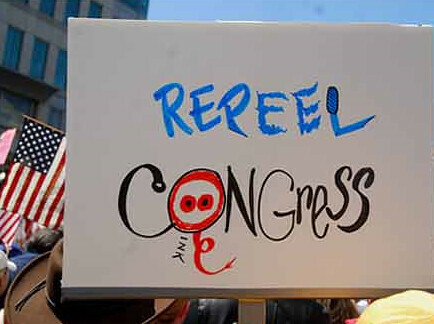 Does this person want us to put the peel back on Congress or take the peel off again? I’m not sure. Cute pig. This sign is sort of a double. 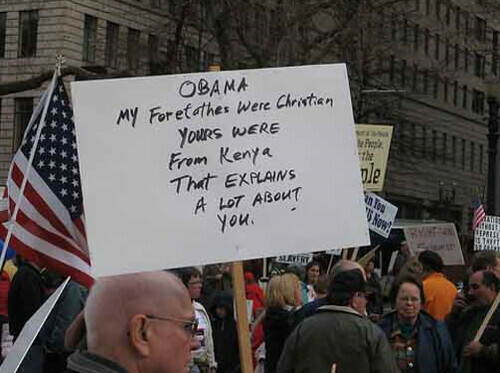 First we get the reference to the racist idiot’s “Forefathes”. That must be a term with religious significance with which I’m not familiar. But just in case that wasn’t enough, the guy goes full bore racist with the Kenya reference and the statement “that explains a lot about you”. 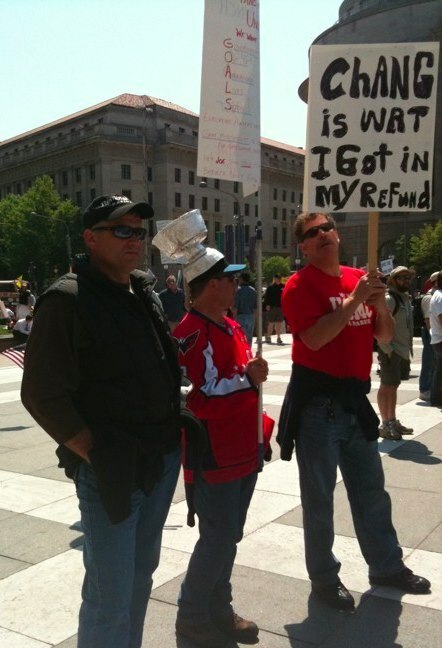 Nope, no racism in the tea party movement. Move along, move along. 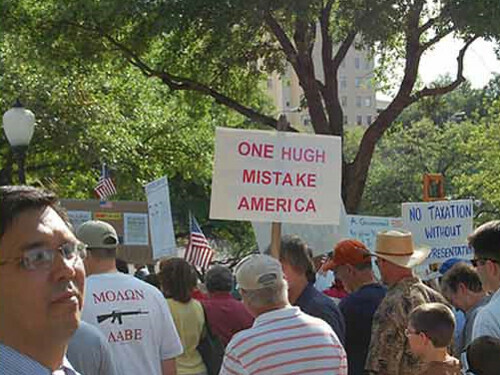 Yep, one “hugh” mistake to let this guy graduate from high school. 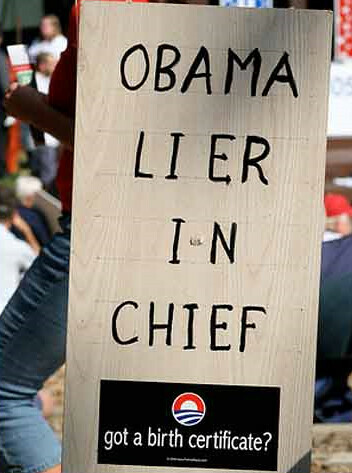 For the record, according to The Free Dictionary, “lier” means “[o]ne who lies down; one who rests or remains, as in concealment.” Did the person who made this sign mean to suggest that President Obama is resting or hiding on the job? 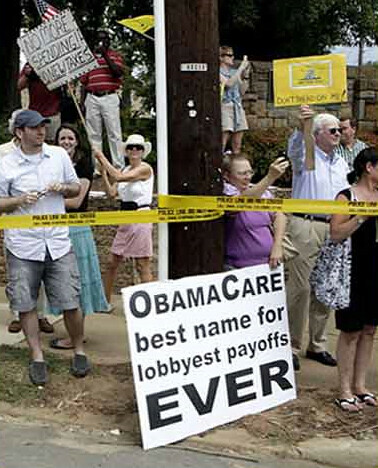 We all know that “lobbyest" payoffs” were the primary reason for passage of the healthcare reform legislation. I’ve written before about the calls for President Obama’s impeachment without any reason. 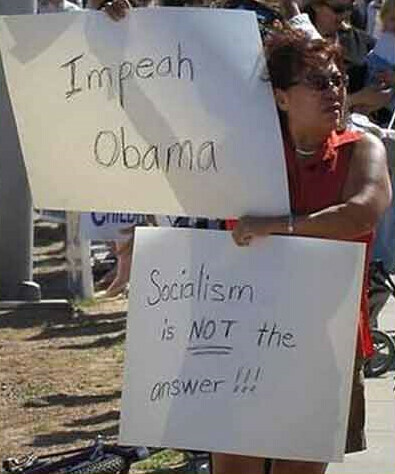 Now this lady has gone even further and called for us to “Impeah Obama”! Ooh, scary! “Illegal alliens”! Cute sailor outfit, though. 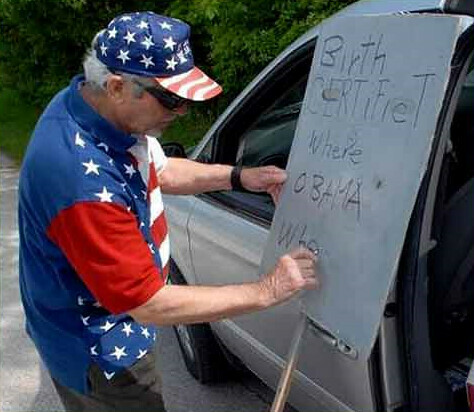 Either nobody honked at his sign or nobody driving by was able to spell, either. And does this guy think he’s one of the men in black? They’re right. 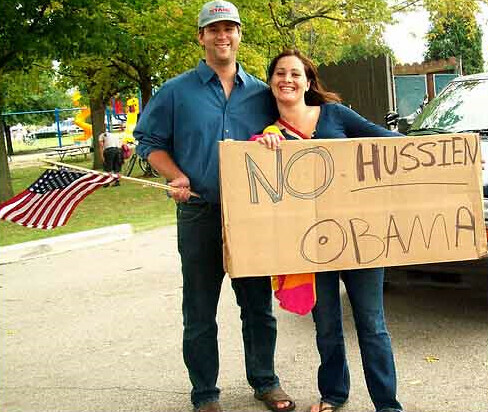 There is no “Hussien Obama”, just a “Hussein Obama”. But using that oh so scary middle name really helps to convince me that there isn’t any racism afoot. 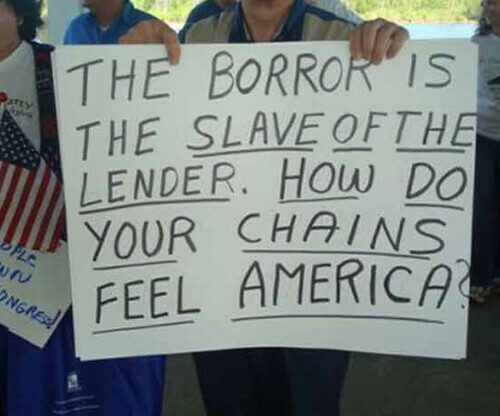 I had to read this one carefully before I figured out what a “borror” was. 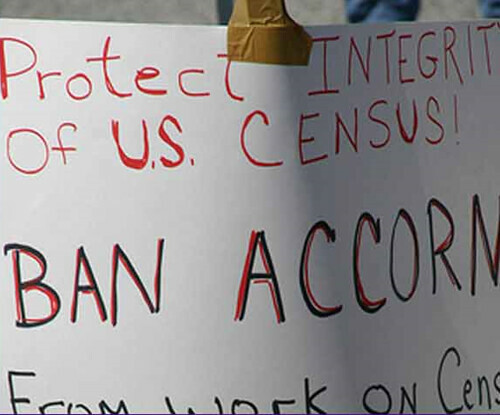 Forget that ACORN is not involved in the census; forget that ACORN has essentially ceased operations; forget that the whole pimp and whore videotape scandal was essentially a hoax; and forget that banning a group like ACORN would violate both the First Amendment (freedom of association) and the provision against bills of attainder in Article I Section 9 of the Constitution. None of that matters if you can’t even spell ACORN! 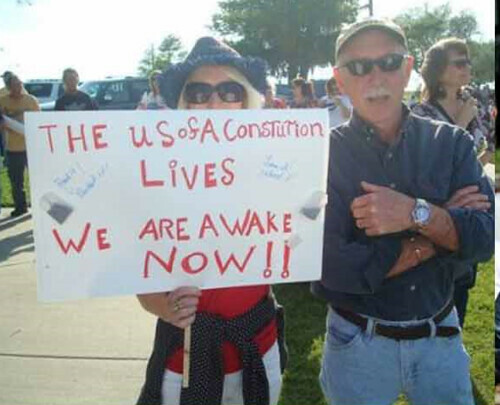 I’m not even going to try to make sense of the spelling or grammar on this one. 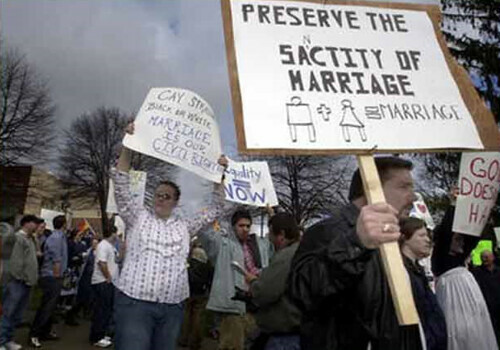 So what exactly is the “sactity of marriage”? Does that have something to do with the man getting to tell the woman what to do, her being barefoot and pregnant, and the two of them having a bunch of kids that can’t spell? The little N with the arrow is a nice try. 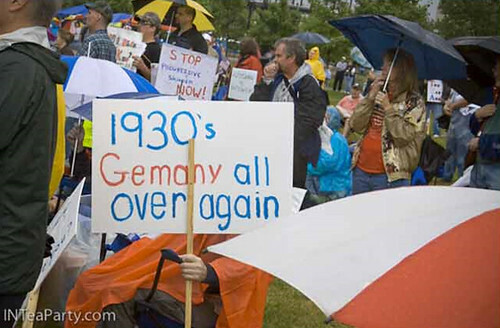 What happened in “Gemany” and I didn’t know that 1930 owned this “Gemany”. Well, really, now. 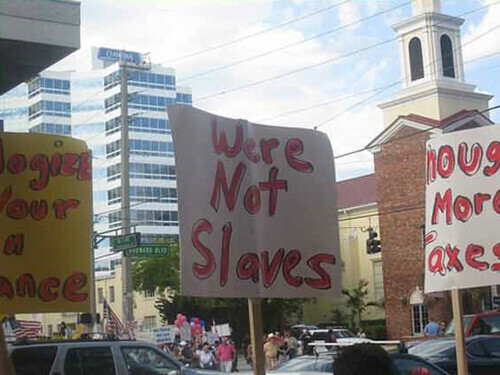 How many of us “were” slaves? I mean, unless you’ve recently immigrated from one of those rare places where slavery is still practiced, it seems really unlikely that you’d be a slave. Random apostrophes must keep falling from the sky. 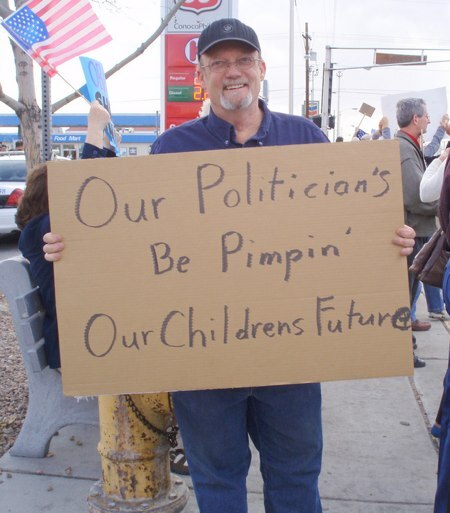 Double stupid apostrophe fail (but he got pimpin’ right, for that extra-special racist touch). Another one that I had to think about for a minute. 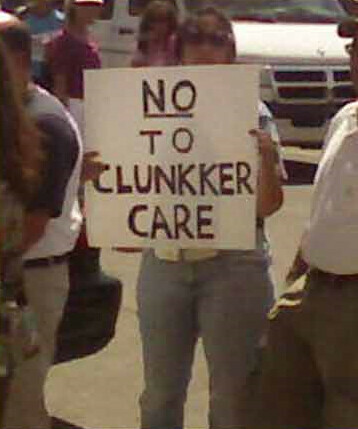 “Clunkker care”? He got a Cambodian temple in his refund? Somehow, I don’t think of Camodian wats as being named Chang, though; that seems more Chinese to me. Try pronouncing “enoungh”. Come on, I dare you! 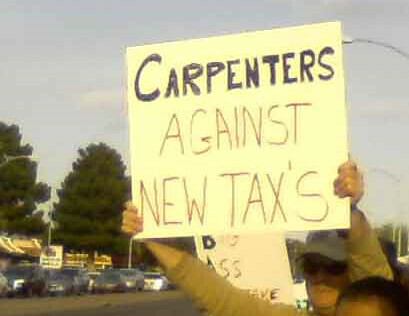 More fun with (missing) apostrophes and a spotting of the rare “thinkg”. 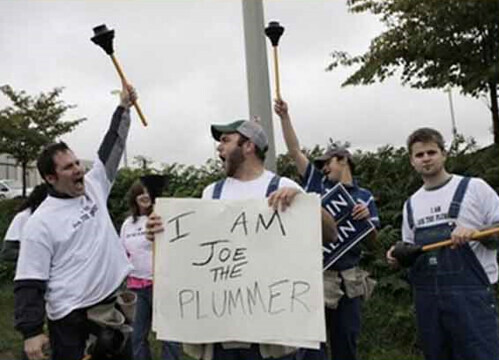 Illiterate “plummers” of the world unite! 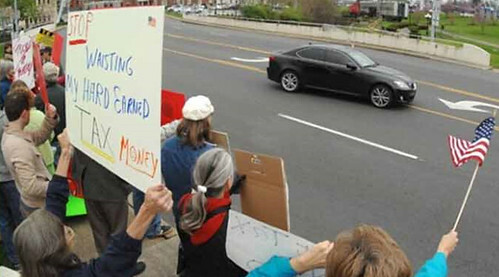 At least those plungers don’t look as dangerous as the guns some teabaggers feel the need to carry to these protests. Another theme running through some of the teabag signs is the anti-immigrant (remember, no racism here…) sentiment expressed by the “English is our official language” movement. 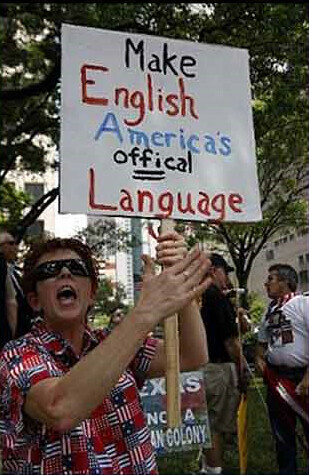 Of course, this “English is the official language” movement might have more success if: (a) it weren’t quite so racist, and (b) those espousing it didn’t offer us gems like “Lanaguage”. 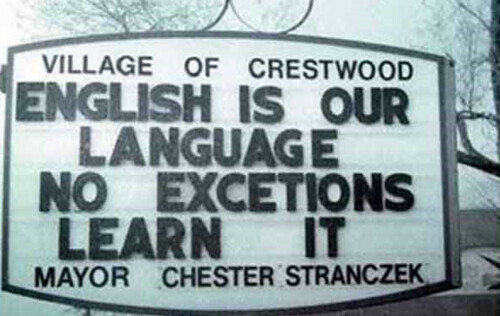 After learning that “Lanaguage” isn’t spelled correctly, the folks of Crestwood might want stop and tell us what “excetions” are. 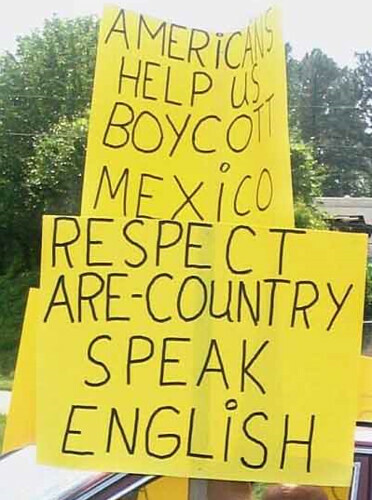 Then the folks of Crestwood can ask this idiot what exactly an “offical” language would look like. A bit more racism to go with the poor grammar: “Are-country”? You know what I think is “Rediculous”? 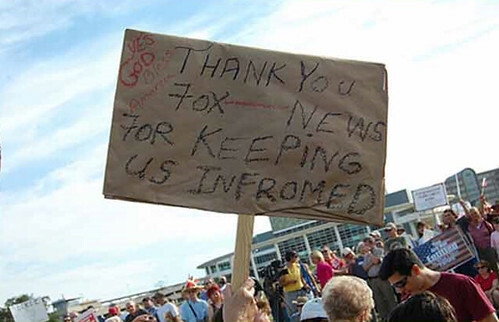 The number of teabaggers who can’t spell correctly and who can’t manage to put a simple apostrophe in the right place.